This page is a summary of Investments to End Poverty Chapter 5. To ensure that aid is best allocated, it needs to be driven by who and where poor people are – and by an understanding of the other resources available. Aid is the main official international financial resource focussed on ending poverty. It can be targeted specifically to: support people where governments do not function and markets are not prepared to take risks; support innovation; and leverage other funds. Official development assistance (ODA) is often the largest international resource flow in countries with the lowest government spending. Aid can be direct investments targeting people, or indirect investments targeting upstream interventions such as global public goods, research on problems facing developing countries and support to international organisations. Aid can invest in both immediate and longer-term benefits. Some forms of aid do not have strong links to reducing poverty, such as covering costs of international students and supporting refugees in donor countries. There are various ways that aid can be delivered, including through cash contributions, loans, commodities such as food aid and staff expertise through technical cooperation. Different forms of aid investments impact on poverty in different ways and each can deliver value. But for the best use of aid, decisions must be driven by need and context. Current ODA data does not provide adequate disaggregated information on how ODA is allocated and who benefits. A quarter of gross bilateral ODA reported to the Organisation for Economic Co-operation and Development (OECD) Development Assistance Committee (DAC) by its members is recorded as regionally unspecified (approximately US$25 billion). This trend is on the increase among bilateral donors. The UK’s volume of unspecified ODA increased from US$790 million in 2010 to US$2.7 billion in 2011. Because of inadequate disaggregated data on who and where poor people are, aid is not effectively targeted at the poorest people. There is little correlation between ODA allocation and where poor people are, with ODA per poor person lowest in the poorest countries. 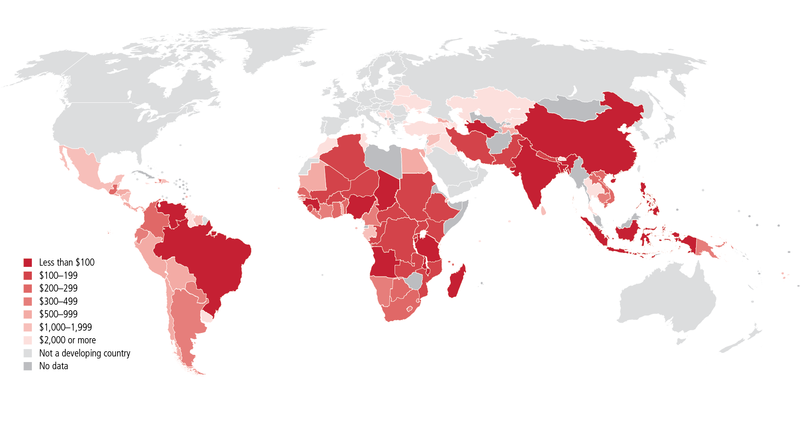 Source: Development Initiatives based on DAC data and World Bank (2013) (see methodology). More and better data supports more transparent choices on investments. Gathering and sharing information on where aid is spent gives recipient communities a chance to feedback to strengthen accountability and provides donors with a coordination framework. People do not benefit equally from growth, so sub-national data on inequalities and resources is critical for aid to be targeted at the poorest people. Geocoding and mapping aid against local distributions of poverty helps to target, coordinate and assess impact. Different types of projects have different timeframes for impacting on poor people. Upfront funding is important for people living in poverty. Information on the time it takes for the benefits to be felt by poor people should be balanced against project impact to inform choices about aid allocation. Appropriate use of ‘discount rates’ can be used to measure one intervention against another. A clear idea of who benefits is critical for making choices about the best use of scarce aid resources. This can be achieved by assessing the efficiency of different interventions, such as cost-benefit analysis, while ensuring ODA does not focus on what is easiest to measure. Aid can mobilise public-private partnerships and scale-up private investment. It can build bridges between poor people and existing resources, enable governments’ to mobilise domestic revenues and work directly with other financing to increase the volume of resources for ending poverty. But blending aid with other sources of finance is not a panacea and success is not automatic. Different actors need to harmonise their priorities around poor people’s needs if leveraged finance is to help reduce poverty. Aid should be neutral and reflect the needs and priorities of poor people above the donor. US$27 billion of aid is ‘tied or partially-tied’, usually to procurement practices, where recipients must buy goods and services from the donor country. Tied aid inflates project costs by 15-30% and regularly goes unreported. Loans are often considered appropriate for wealthier countries and productive sectors that will generate financial returns. But in 2011, US$3.6 billion was lent to countries at moderate risk of debt distress, and 30% of lending went to social sectors in 2012, despite the lack of revenues to service loans. The choice between the use of aid and other official financing instruments should be determined by what is most appropriate for achieving the desired goal, not what is politically expedient. The higher the discount rate, the faster the value of every dollar is seen to diminish. A higher discount rate means that poverty reduction in the short term is valued more highly.